The picture is from a summer birthday celebration in October 2012 of my daughters and I. My biggest challenge in this LO was the use of colours because for me, they're not colours I'm comfortable with. I'm happy with the layering (especially the framing of the photo) and the stamping/inking of the background. Stamps and Inks: SU Gorgeous Grunge, SU Beautifully Baroque, Tim Holtz Distress Ink Soot Noir and Crushed Olive. Tools: SU Square Framelits, SU Baroque embossing folder, SU Decorative label punch, Martha Stewart lace punch. It's a really nice LO with lovely colours!! 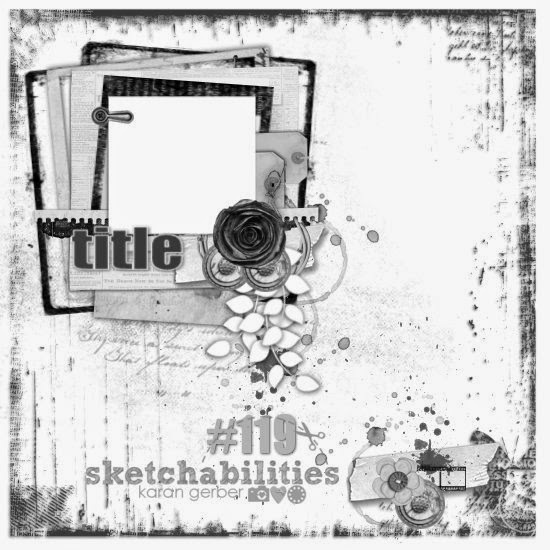 !Thank you for sharing your page at Sketchabilities!!! Very pretty! Thanks for joining us at Sketchabilities!